Heat olive oil in a Dutch oven over medium-high heat. Add onion, garlic, and red pepper to pan; sauté for 2 minutes. Add mussels, scallops, and shrimp to pan; sauté for 1 minute. Stir in 1/2 cup clam juice, parsley, and diced tomatoes; bring to a boil. 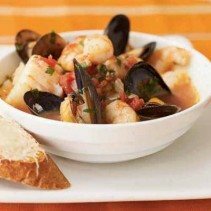 Cover, reduce heat, and simmer for 10 minutes or until mussels open, and discard any unopened shells.